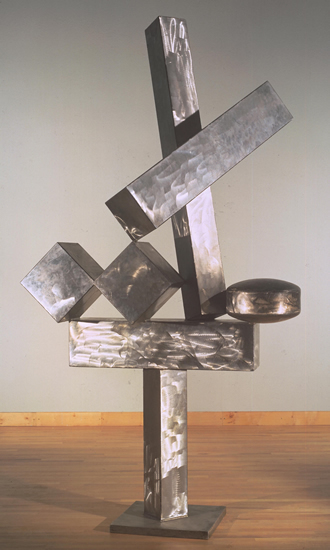 Although the Tate acquired Cubi XIX, a huge stainless steel sculpture by David Smith in 1966, he has been a largely unfamiliar presence on these shores. An elegant show at Tate Modern offers a real chance to see why he ranks amongst the best sculptors of the last century. Smith’s welded steels look good inside the Tate’s post-industrial space. Those familiar with Smith though will yearn for them to be outdoors so that his Personnages, as he called them, could engage in a real dialogue with their surroundings. Early in life, Smith, who was born in 1906, fell in love with the Adirondack mountains around his home and studio in upstate New York. 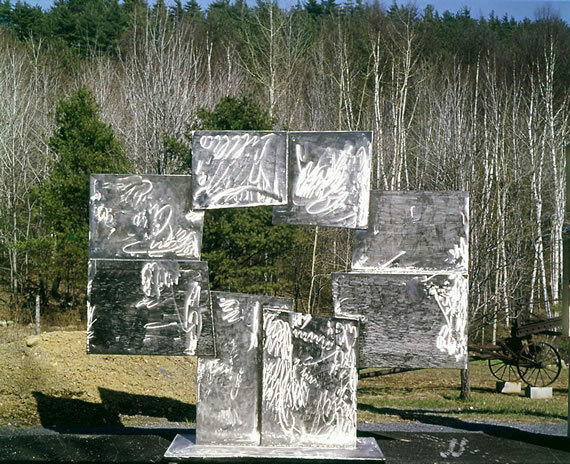 When he ran out of space in his Bolton Landing workshop, Smith placed dozens of his big sculptures in the surrounding fields. Eventually, the result became a truly magnificent installation set against a changing landscape. The sculptures in their outdoor settings can be seen in a few photographs in the café area at the Tate, in a massive new book about Smith by Carmen Giménez and in the filmed interview from 1964, The Sculpting Master of Bolton Landing, at the end of the exhibition. We need to see the setting and the sources of his inspiration to help us truly appreciate him because Smith was a son of European Modernism, but also an archetypal American. Peter Stevens, the director of the David Smith Estate, noted in opening the London show that Smith’s work was “riven with contradictions”. From the beginning, the artist moved easily between painting and sculpture, denying that there was a sharp division between the two. He combined industrial power and technology with the skill of hand craftsmanship. He made monumental structures and yet his forms and surfaces are often elusive and secretive. Smith’s trajectory as an artist is inseparable from the social and political changes in American culture and more widely, the impact of events in Europe. His evolution was part of the coming of age of American art in the mid 20th century, a phenomenon which has provoked an endless stream of political controversy, especially in relation to the Abstract Expressionist movement. The birth of the New York school – which encompassed a wider range of styles than is usually recognised – and its subsequent evolution, was bound up with the American communist movement, disillusionment over Stalinism and the polemics of critics like Clement Greenberg. In recent years, historians like Andrew Hemingway in his Artists on the Left has shown the powerful socialist and communist impetus that inspired US artists from the 1930s to the Cold War era. Arriving in New York as an outsider from Indiana in the US Mid West, Smith voraciously appropriated Cubism in both painting and sculpture and the innovations centering on Paris. He became an avid admirer of Picasso from 1929, two years after enrolling as an art student in New York. 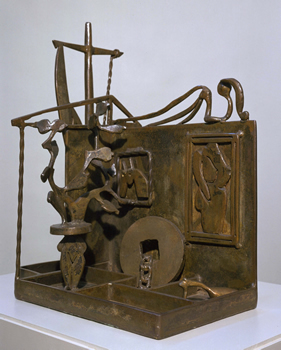 And, like Picasso, he absorbed the history of sculpture from the earliest times, and incorporated it into his own production in an entirely fresh way. “My understanding of art started with Cubism,” Smith told critic Frank O’Hara. He goes on to reveal an intimate grasp of the exact nature of Picasso and Braque’s pictorial revolution and their new concept of space. With his first wife, Dorothy Dehner, he travelled to Europe and the USSR in 1935. He was a strong trade unionist and worked in the Roosevelt government’s Federal Arts Programme, as did many other notable US artists at that time. As Fascism took power in Germany and Spain and World War II loomed, Smith made his Medals for Dishonour, a series of bronzes which explicity denounced war and capitalism. Smith’s politics are played down by the curators of this show – his medals are not simply pacifist. They satirise many aspects of capitalist society, including religion, the state, industrial agriculture, medicine and the oppression of women. The outspoken political narrative in Medals for Dishonour forms an exceptional phase in Smith’s oeuvre. Before and after the Medals, Smith made delicately airy narratives, often picking up domestic and family themes. Sometimes they are surreally introspective as in The Home of the Welder (1945), sometimes humorous. They are always inventive and technically accomplished. Frequently there is a strong affinity, even a friendly rivalry, with Picasso and European sculptors like Giacometti. By Smith now had an expertise with steel, a confidence and inventiveness which took him into new places as he bent the toughest of metals to his will and fantasy. Hudson River Landscape, made in 1951, is one of Smith’s most lyrical works. It has a new optimism. 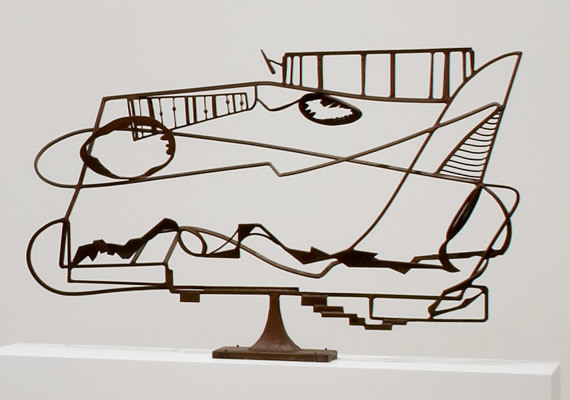 Mounted half-way through the exhibition, it marks the fruition of Smith’s way of shaping and welding thin pieces of steel into an eloquent and spiky calligraphy. Like a brush or pen runnings over a surface, the rust-coloured steel flows through space. Forms are recognised and half-recognised as in a fast-moving dream. On one side is a hollowed-out oval, almost like a sleeping head, echoed by a second one, jagged inside and smooth on the outside. Sideways ladders – or perhaps they are railway tracks – float above, held on by fragile welded joints. We are led to enter into the moving forms by steps, as though boarding a train. Glimpses through the compartment windows glide past our eyes. A short spell in Italy in 1962, sponsored by the Italian government, gave Smith his first opportunity to make monumental welded pieces on a grand scale. In an abandoned factory he made the Voltri series. They hark back to archaic Roman and Etruscan themes like chariots, and ploughs, their pared-down shapes moving towards a greater freedom and abstraction. But while the circles, squares, wedges and curves are increasingly geometric, there is still a narrative, sometimes mischievous approach. At the time of his untimely death in a car crash in 1964, Smith was making his Cubi series, 28 stainless steel pieces, which show him still extending the possibilities of Cubism in a grand architectural spirit. Cubi XXVII, one of his last works, is outstandingly graceful even while being made up of heavy steel blocks. The structure of this Cubi is reminiscent of Mark Rothko’s great series of the late 1950s, especially Red on Maroon which is in the Tate’s own collection. Viewed from the front, the shiny steel blocks frame an empty space, so that it is made up of air more than solid mass. The lintel at the top of the opening is delicately poised just at the edge of the upright, demonstrating the welder’s expertise. The solid is negated by a hovering sensation. The enclosed space acquires its own shape. Viewed end-on, the entire structure almost vanishes. Smith burnished the surface with light doodlings which are gloriously spontaneous. Like Rothko’s feathered edges they give an almost diaphanous feeling which sets afloat the regular, sometimes ponderous cubes and beams. The reflective surface, as he said himself, is part of the concept, not an added-on feature. 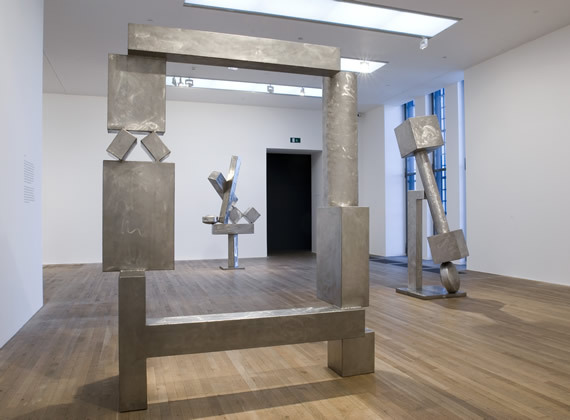 David Smith is at Tate Modern until January 21. Admission £7/£5.50. Open daily. Late evenings Friday and Saturday.